The B.C. Lions' playoff quest faces a stiff test this weekend. B.C. (7-7) visits the Calgary Stampeders (12-2) on Saturday night. The Lions enter action tied with the Edmonton Eskimos for fourth in the West Division standings while the Stamps are first with the CFL's best record. But that's not all. Calgary is a perfect 7-0 this season at McMahon Stadium while the Lions are a dismal 1-6 on the road. Calgary has already clinched a home playoff game. But the defending West Division champion is looking to cement top spot and punch its ticket to the conference final once again. B.C. has climbed back into playoff contention, winning four of its last five games, and is coming off a 26-23 home victory over the Toronto Argonauts. 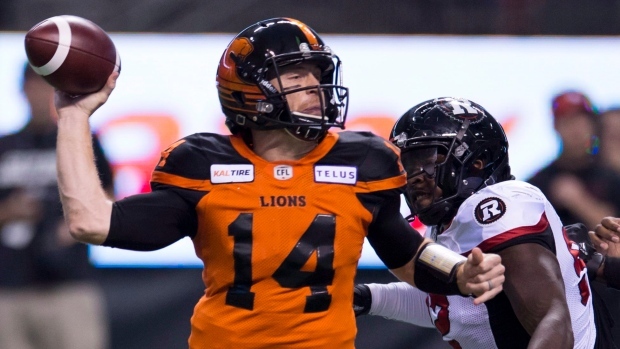 But the Lions will have a different quarterback under centre as veteran Travis Lulay returns to the starting lineup. Lulay, 35, suffered a left shoulder injury in the Lions' 32-14 home win over the Montreal Alouettes on Sept. 14. The Lions went 2-1 with backup Jonathon Jennings. Jennings was just 14-of-24 passing for 199 yards and a TD versus Toronto but also added 47 yards rushing on three carries. Jeremiah Johnson was the Lions' offensive stalwart, running for 118 yards on 19 carries while adding three catches for 22 yards. But the Lions still needed six field goals from Ty Long to fend off a spirited comeback attempt from Argos backup James Franklin. Branden Burks, replacing the injured James Wilder Jr., ran for 92 yards on eight carries (11.5-yard average) also. B.C. 's defence allowed 402 offensive yards and registered just one sack. But the unit also had four interceptions, including two by Davon Coleman. Stout defence led Calgary to a 12-6 road win in Montreal last weekend as quarterback Bo Levi Mitchell earned his first victory at Molson Stadium. Mitchell finished 20-of-34 passing for 199 yards with three interceptions but the Stampeders' defence had three sacks and three interceptions. Calgary has outscored its opponents 204-116 at home and is 4-2 within the West Division. By comparison, B.C. has been outscored 216-149 on the road and has just two wins in six contests against Western rivals. At Toronto, Franklin begins his second stint as the starter for the Argos (3-11). He was 1-3 earlier this year before losing the No. 1 job to McLeod Bethel-Thompson. The defending Grey Cup champions won't be in the playoffs but Hamilton (7-7) comes off the bye just two points out of first place in the East Division having won the two previous meetings. At Winnipeg, the Bombers (8-7) have won three straight to move into third in the West Division standings. Matt Nichols threw three TD passes while Andrew Harris ran for 132 yards on 20 carries in last weekend's 40-32 road win over Ottawa. Saskatchewan (10-5) has also won three consecutive games and six of its last eight. At Edmonton, these are troubled times for the Eskimos (7-8) who've dropped three straight and six of their last eight to stand last in the West Division standings. Ottawa (8-6) comes off a 40-32 home loss to Winnipeg as Trevor Harris threw for 349 yards and three TDs. Rookie Lewis Ward has made a CFL-record 40 straight field goals and 43-of-44 overall.